You are Just FEW more days away from your Life Changing Event - Tony Robbins' four day ‘Unleash the Power Within’ held in London. This event is designed to help you break through your limitations, conquer your fears and to become empowered. The days are long during the event and it will keep you fully occupied with all the dancing, jumping and clapping. Its such an high energy event, that by the end of the day you are bound to get a little exhausted. Hence to make you ready for the event, we have prepared this checklist guide to get you started preparing for the UPW 2019. 1) Prepare to overcome your limitations. Tony Robbins will help you break the unconscious fears that are holding you back. This isn’t always easy, so be ready to tackle your fears and turn limitations into positive actions. This event will get your feet moving, your body swaying and your arms swinging. Even if you hate dancing or can’t dance at all, this experience will get your body shaking. Prepare to take part and move your body like never before! 3) Leave the high heels at home. You will be attending a lively, high-powered event, so leave the high heels at home, put on your comfy shoes, and prepare to get moving. 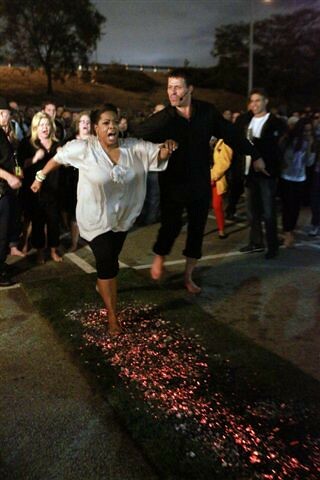 4) Be prepared for the Firewalk experience. Walking across a bed of hot coals between 1,200 and 2,000 degrees Fahrenheit might sound scary, but once you do it, you’ll want to do it again. And don’t worry, you won’t get burnt and it’s not compulsory. 5) Prepare to be amazed! Tony Robbins is an incredible person. He has overcome many challenges in life and conquered his demons. Now, let him help you face your fears and breakthrough to your new life. 6) Prepare to tackle your biggest goals. This event will allow you to develop a clear target of what you want in life. You will replace beliefs that limit you with empowering beliefs that will help you to tackle your goals. 7) Prepare for it to be an intense day. The days are long, but the hours fly by. Bring food to keep yourself energised and to save yourself from long queues. 8) Take a friend/family member/significant other. This will be an incredible experience, one you cannot simply sum up to someone. Therefore, to make the most of this experience, share it with someone else and go on the amazing journey of transformation together. 9) Scope out your surroundings. It’s a good idea to know where things are. For example, when you’re bursting for the loo after being in a seminar for hours, you’re going to want to get to the bathroom pretty fast. 10) Come with an open mind. You have a rough idea of what to expect for this event, but it will most likely exceed far beyond your expectations, so prepare yourself for the unknown. Keep an open mind, take part and enjoy this life-changing experience. Hope this UPW preparation checklist helped you to get ready for the Unleash the Power Within event. Hope you are now completely ready to begin you journet of transformation with UPW. I want to Attend Tony Robbins Event!